The birth of Jesus—the Nativity—is certainly an outstanding Catholic feast of the year, with so many rituals—Christmas pageants, crèche scenes, and special Masses—built around it that it stands out as very special. Still, Catholics in different cultures, often on the basis of long-standing traditions, celebrate the incarnation, from Advent through Epiphany, in a great variety of ways. In the Philippines, Christmas songs begin playing by early September, and decorations are up from September to January. Pre-dawn Masses known as Simbag Gabi pack churches in the nine days leading up to Christmas. In secular Denmark, Christmas is nonetheless a major cultural event, as is an associated celebration of light that precedes it, St. Lucy’s Day. 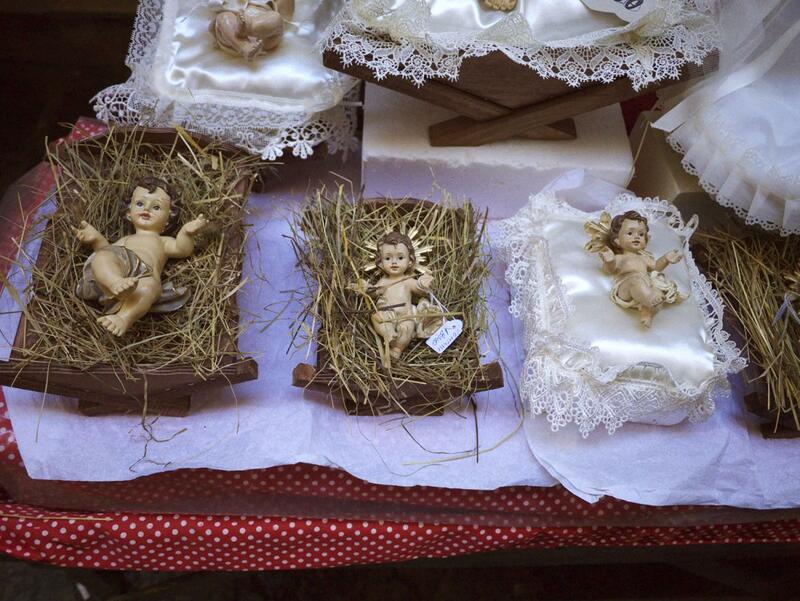 Many Italians carefully set up presepe in their homes and piazza, and even organize living presepe. Ukrainian Greek Catholics mark Advent as a time of fasting and abstinence. Yet for them, the feast of St. Nicholas, in early December, is the date for gift-giving to children. They break the fast with a 12 course Holy Supper after the first star shows on Christmas Eve, and end the Christmas season 12 days later with Jordan, the Feast celebrating the Theophany at Jesus’ baptism. In the old Catholic coastal towns of Veli and Thumba, India, Christmas is celebrated by bathing at the beach (the only time of the year that this is done), and by dances in the street at night after midnight Mass. In Northern European and American contexts, the cultural norm is to regard the time of parties and shopping that runs from the end of November, after the Thanksgiving holiday, until Christmas day itself, or a few days later, as “the Christmas season.” A Christmas tree put up at Thanksgiving might typically be taken down on December 26 or almost always by December 31. The Church works to call attention to Advent, but competing notions of “the Christmas season,” for mostly commercial reasons, work against that. During Las Posadas, in Mexico, candlelight processions with children go from door to door for nine days, like Mary and Joseph searching for room to lodge. Las Posadas ends on Christmas Eve, which is celebrated in earnest, as children get to break open piñatas containing small treats. But Mexicans tend to mark Christmas itself as a quiet day of rest from the events leading up to it. Tres Reyes—Three Kings Day, January 6— is the day for giving gifts, as the Magi did. Puerto Ricans also place special emphasis on the Three Kings Day, which is celebrated with gifts and dinners. In some places, there are specific foods customary to various Nativity feasts, such as fish or turkey or ham, while in others it is simply important that the meal be special. In Spain, Portugal, France, and many Latin countries, a special cake is served on Three Kings’ Day, with a prize baked in for one lucky person to find. Like Orthodox Christians, Ukrainian Catholics in Canada celebrate the Nativity according to the old Julian calendar, on January 6. The celebration of the Incarnation traditionally begins at home with a 12-course meal that starts on Christmas Eve, January 6, as soon as the youngest member of the family spots the first star in the evening sky. Salvadorans are especially fond of setting up decorative crèches with blinking lights. Salvadorans have absorbed American secular representations of Christmas. Home to many Christmas traditions such as Christmas trees, craft fairs and fruitcake, Germany keeps the celebrations mostly secular. The nativity scene or crèche, called in Italian the presepe or presepio, brings to life the story of the Nativity as told in the canonical as well as apocryphal gospels. Christmas celebrations might include a tour of a local presepe vivente, a theatrical reenactment of the nativity story. The Feast of the Three Kings, or the Feast of the Epiphany, is celebrated as a big event among Filipino Catholics every January 6. Christmas in the Philippines, Filipinos like to say, stretches longer than anywhere else in the world, from September to January with carols and gift-giving, novenas and Masses, feasts and processions. On each of the nine mornings leading up to Christmas, Filipino Catholics gather in the pre-dawn hours for Simbang Gabi, a novena of Masses that anticipates the celebration of Christmas. Churches are generally filled out the doors. Twelve days after Christmas, in the midst of the short, cold days of January, Ukrainian Greek Catholics celebrate, in a second way, God coming into the world. The feast, commonly called “Jordan” but properly called the Theophany, recalls Jesus’ baptism by John in the River Jordan and the revelation of the Trinity.